Durham, NC - The Bulls scored in all but two innings and had three home runs as they routed Lehigh Valley 10-3 on Saturday night at Durham Bulls Athletic Park. Brian Baker tossed five scoreless innings for his second consecutive victory, and was helped on offense by homers from Fernando Perez, Justin Ruggiano and Dan Johnson. The Bulls put two on the board in the first inning, loading the bases with nobody out to start the game off IronPigs starter Joe Savery. One batter later, Joe Dillon brought home a run with a single and Chris Richard hit into an RBI force play later in the inning to make it 2-0. After two scoreless innings, the Bulls added single runs in each of the fourth and fifth innings. Perez took a 2-2 offering by Savery over the wall in left field in the fourth inning, in the fifth Justin Ruggiano doubled and scored on a sacrifice fly by Dillon to extend the lead to four. They would double their lead in the sixth inning, as Michael Stutes came out of the bullpen but could not slow down the Bulls attack. Desmond Jennings had an RBI single, and another run came home on a double play by J.J. Furmaniak. With a runner on third and two down, Ruggiano connected for his sixth home run of the season off the Triangle Orthopedics sign in centerfield to make the score 8-0. The Bulls finished their scoring with single tallies in each of their final two at-bats. Perez added another RBI on a force play in the eight, while Dan Johnson blasted a solo home run in the bottom of the eighth, his 18th of the season which ties him for the International League lead. With the lead firmly in hand, Baker kept the IronPigs off the board through his five innings of work. After filling in the rotation when LHP Carlos Hernandez went on the DL, Baker has allowed two hits through 10.0 shutout innings of work in two starts. With the victory, he improves his record to 6-0 on the season while dropping his ERA to 2.80. 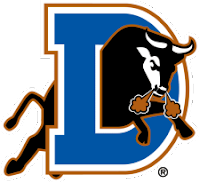 Lehigh Valley got their runs in the eighth inning, putting a three-run inning together off Bulls right-hander Dale Thayer. After retiring only one of the six batters he faced and throwing two wild pitches, Mike Ekstrom came out of the bullpen and finished the final five outs to close out the victory. The win improves Durham to 45-30 on the season, while Lehigh Valley’s fifth straight loss drops them to 29-46. The two teams continue their series tomorrow as LHP Heath Phillips (6-6 4.14) takes on LHP Brian Mazone (4-7 3.77). Game time is set for 5:05 p.m.